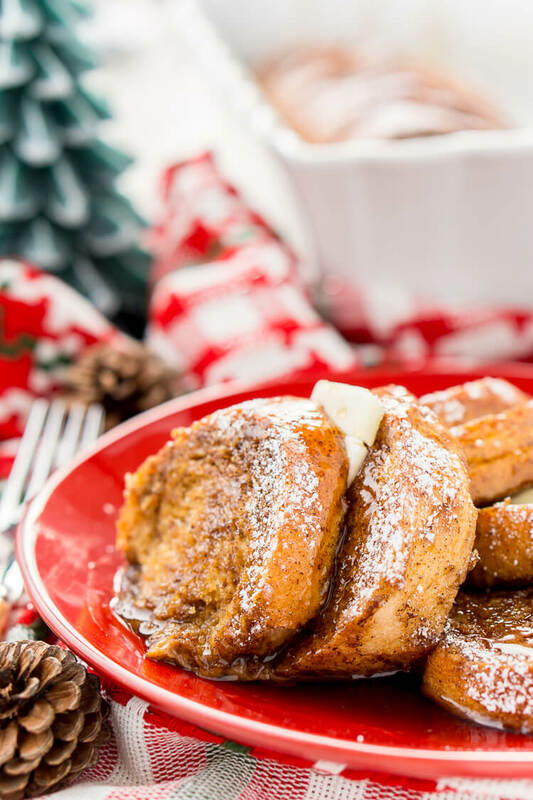 This Gingerbread French Toast Bake Casserole is the perfect way to kick off a snowy holiday morning or any morning for that matter! It’s easy to make and bursting with the sweet and spicy flavors of gingerbread and you can prep it the night before if you’d like! Did you know today is National French Toast day? I feel like it totally should have been over the weekend because it’s Monday and all and who has time to make french toast on a Monday? Not I! In fact, I’m packing my bags and headed to Poland and possibly the Czech Republic for the week to indulge in some Christmas markets! 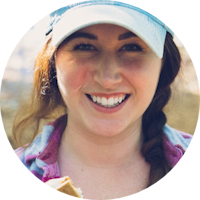 I’d love for you to follow along with my trip on Instagram, it’s going to be amazing! But even though it’s a Monday and everyone is back to work after a long holiday weekend, there’s no reason you can’t make Tuesday extra special by prepping this Gingerbread French Toast Bake Casserole tonight for tomorrow morning! I promise it will make the day a whole lot more enjoyable! Gingerbread is one of my favorite flavors of the season! I’m not much for peppermint, though you’ll never see me turn down a slice of my Peppermint Cocoa Cake! But there’s something completely cozy about the sweet and spicy blend of gingerbread that screams Christmas to me! 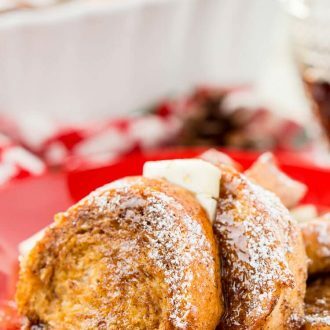 And even though most of us enjoy gingerbread in the form of cookies or cake, it makes a for killer holiday breakfast too! Oh and a pretty amazing sugar scrub that will leave your skin feeling amazing and makes a great gift! 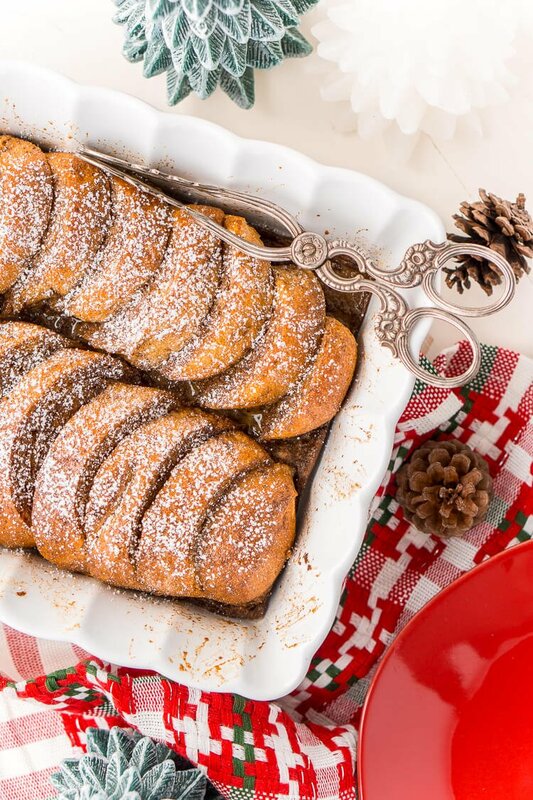 This Gingerbread French Toast Bake Casserole is super easy to whip up and the best part is that you can prep it way ahead of time and bake it just before you’re ready to indulge! 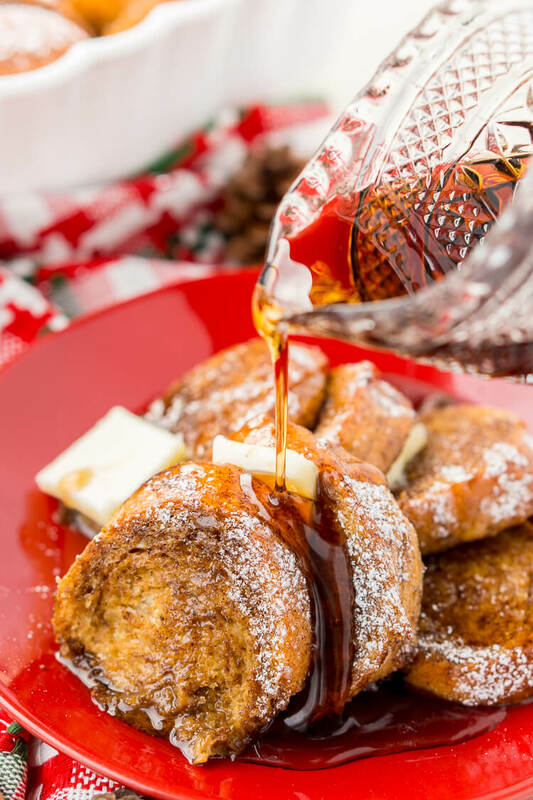 It’s made with a milk and egg base just like french toast, but there’s also butter, molasses, maple syrup, and tons of spices that have been added to the mix that the french bread slices are soaked in. They have to soak for at least an hour, but then you just bake for about 20 to 25 minutes and you’re left with a warm and delightful breakfast casserole! 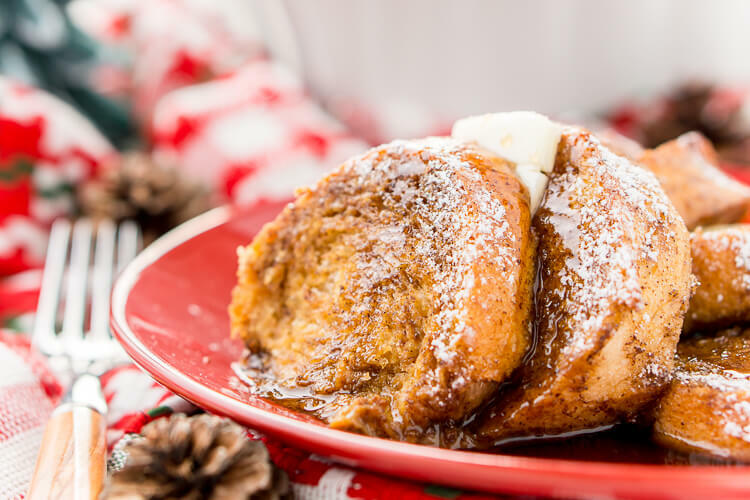 Don’t forget to top it with butter, confectioner’s sugar, and maple syrup for a crazy-delicious finish! 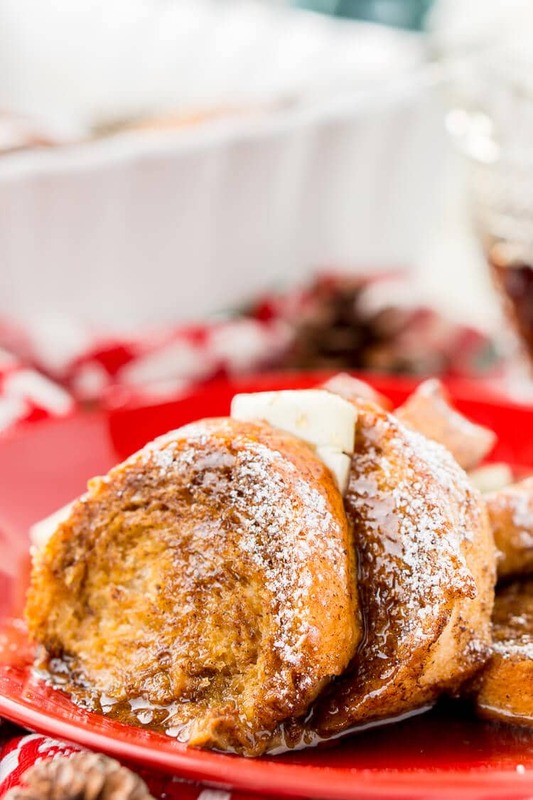 Watch how to make this gingerbread french toast below! 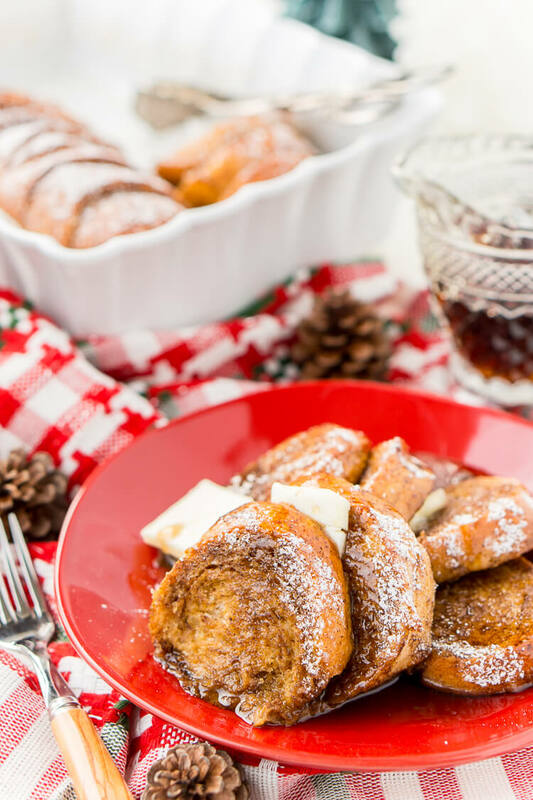 This Gingerbread French Toast Bake Casserole is the perfect way to kick off a snowy holiday morning, or any morning for that matter! It's easy to make and bursting with the sweet and spicy flavors of gingerbread and you can prep it the night before if you'd like! Melt butter in a microwave-safe dish and set aside to cool a bit. Arrange bread slices in baking dish, either flat and tightly fit together, or standing at an angle and slightly overlapping if necessary. Whisk milk, eggs, maple syrup, molasses, cinnamon, allspice, ginger, nutmeg, cloves, and salt together in a bowl. Mix in the melted butter. Pour milk and egg mixture over bread, turning to ensure slices are evenly moistened on both sides or use a basting brush to help coat the bread. Cover dish with aluminum foil and refrigerate at least 1 hour or overnight. Remove dish from the refrigerator and uncover, then use a basting brush to brush the bread with any excess liquid right before baking. Bake in preheated oven until slices are firm and golden brown, 20 to 25 minutes. Remove baking dish from oven and allow to rest for 10 minutes. Dust with powdered sugar and serve with maple syrup. *I used a Pillsbury can for the French Bread and baked it up ahead of time, a large loaf may require more milk in the recipe. 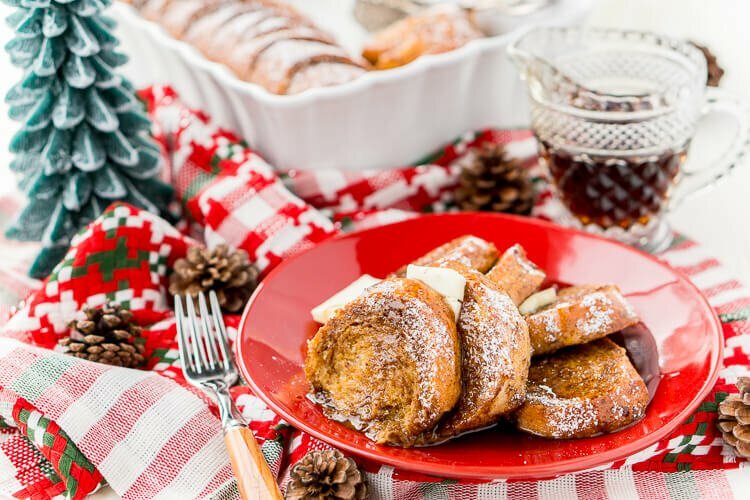 This looks like the perfect breakfast for Christmas morning! Yum!